Information from Reed Browning from a "Browning Genealogy." William Russell Hill was born on 20 July 1684. He was the son of (?) Hill. William Russell Hill married Frances Needless on 7 September 1710. William Russell Hill died in 1746. Lucy Russell Hill was born circa 1833. 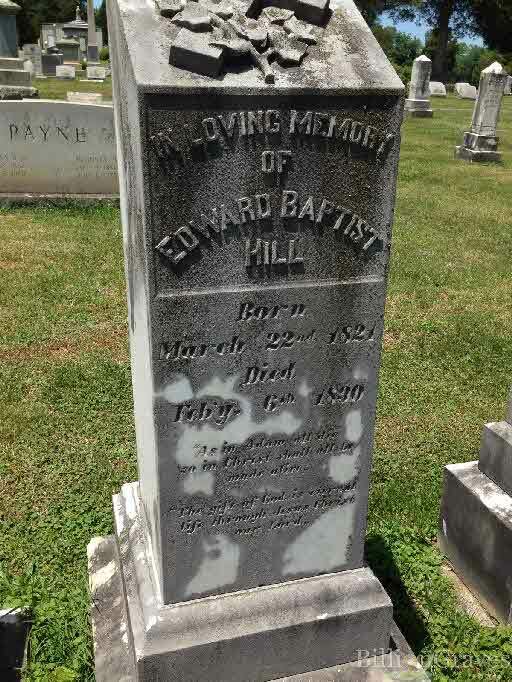 She was the daughter of Major Thomas Hill and Fannie Russell Baptist. Ann Powell Hill was born on 6 June 1865 at Culpeper, VA. She was the daughter of General Ambrose Powell Hill and Kitty Grosh Morgan. Ann Powell Hill died in 1868. Frances Russell (Russie) Hill was born on 1 August 1861. She was the daughter of General Ambrose Powell Hill and Kitty Grosh Morgan. Frances Russell (Russie) Hill died on 19 July 1917 at Ashland, VA, at age 55. Lucy Lee Hill was born in 1863. She was the daughter of General Ambrose Powell Hill and Kitty Grosh Morgan. Lucy Lee Hill died in 1931. 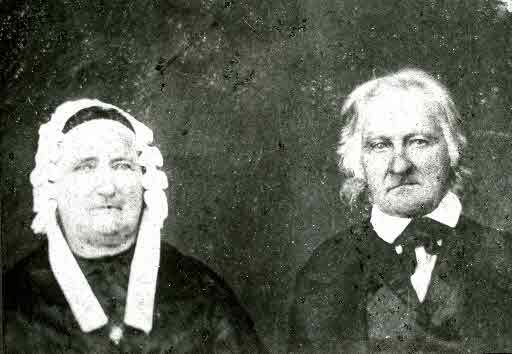 Edward and Mildred were enumerated in the 1850 Fairfax, Culpeper Co., VA, federal census. He was a merchant, 28, she was 25. The only child in the household was Ellen Lewis 2. Also enumerated in the household was brother Thomas T. age 30 and his wife Ariadne 27 and their children Thomas R. 8, and Georgia O. 3. E.B. and Mildred were numerated in the 1860 Fairfax, Culpeper Co., VA, federal census. He was a farmer, age 38, she was 34. Children in the household were Nellie 11, Fannie 4, Jeff 2, and Thomas 18. [S807] Find A Grave, online http://www.findagrave.com, memorial # 111798366. Henrietta Hill was born in 1860. She was the daughter of General Ambrose Powell Hill and Kitty Grosh Morgan. Henrietta Hill died in 1862. Joseph and Musha A. were enumerated in the 1850 Hanover, Cook Co., IL, federal census. He was a farmer, age 34, she was 28. Children in the household were George 2, and Offilia C. 6 months. Joseph and Martia M. were enumerated in the 1870 Union, Crawford Co., IA, federal census. He was a farmer, age 54, she was 47. Children in the household were George 21, John 17, Peter 14, and Mary 9. [S807] Find A Grave, online http://www.findagrave.com, Find A Grave, database and images (https://www.findagrave.com : accessed 26 March 2018), memorial page for Joseph Hallowell (24 Apr 1816–10 Feb 1880), Find A Grave Memorial no. 57581617, citing Dow City Cemetery, Dow City, Crawford County, Iowa, USA ; Maintained by ADD (contributor 46942490) . [S807] Find A Grave, online http://www.findagrave.com, Find A Grave, database and images (https://www.findagrave.com : accessed 26 March 2018), memorial page for Marcia Manley Hallowell (22 Aug 1822–1 Nov 1897), Find A Grave Memorial no. 57581627, citing Dow City Cemetery, Dow City, Crawford County, Iowa, USA ; Maintained by ADD (contributor 46942490) . Mark Halliwell was born in 1761 at Roxburrough, Sprouston, Scotland. He married Barbara Swan, daughter of George Swan. Mark Halliwell died on 30 June 1853. He was buried at Scotch Ch. Cem., Saratoga Co., NY. Information on the children and their birthdates was copied from the old Bible belonging to Mark and Barbara Hallowell. Bible now in the hands of Ellen Bunyan Bein, daughter of Thos. C. and Ellen Hallowell Bunyan. Ellen Hallowell was the daughter of Robert Hallowell. On one leaf of the Family Record, written in the same handwriting and apparently at the same time, was the list of children. The Bible was published in 1822, so it is apparent the names and dates were written at one time. Cousin Jessie Lesher thinks Agnes hallowell - the first daughter, must be her geat grandmother Nancy, as date of birth is the same. Apparently the first James Halliwell must have died as James S. was born May 6, 1814 and must have been given the same name. John Bunyan, of Berthoud, Colorado, oldest child of Thomas C. and Ellen Hallowell Bunyan, has an old letter, dated Lamptlaw, Scotland, Feb 26, 1796, written by John Halliwell to Mark halliwell, in cae of the Rev. James Mairs, Galloway, county of Saratoga, near Albany, North America. The cemetery in Saratoga County NY has two gray tombstones inscribed as follows: Mark Halliewll died June 30, 1853 AE 92 years Barbara wife of Mark Halliwell died December 9, 1845 AE 72 years. Barbara Swan was the daughter of George Swan. Barbara Swan was buried at Saratoga Co., NY. She married Mark Halliwell. Barbara Swan died on 9 December 1853. Ichabod Adams was born on 4 July 1788. He married Polly Talcott, daughter of Joseph Talcott Jr. and Rebecca Warren, on 20 January 1820. Ichabod Adams died on 16 September 1853 at age 65. Polly Talcott was born on 16 January 1803. She was the daughter of Joseph Talcott Jr. and Rebecca Warren. Polly Talcott married Ichabod Adams on 20 January 1820. Polly Talcott died on 11 May 1885 at age 82. 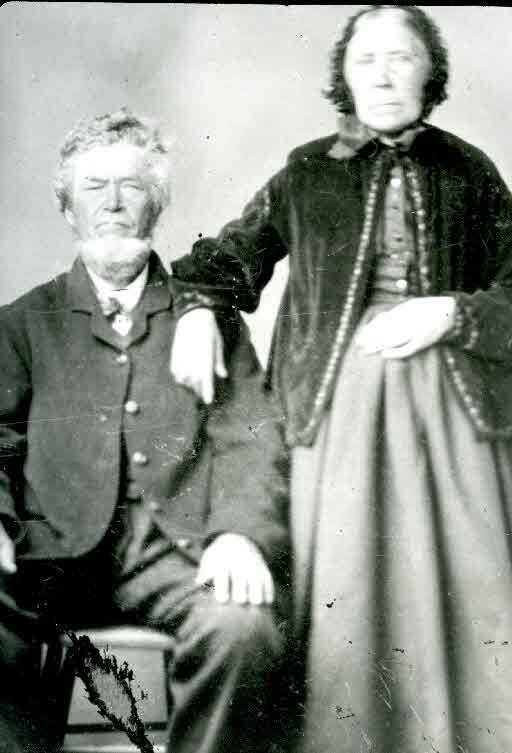 John Scott and Sarah (or Mary) Griffith Scott emigrated to Canada from the county of Wexford in Ireland in 1825 and settled in the township of Beckwith in th county of Lanark. They moved in 1830 to the township of Goulbourn in the county of Carleton in the Province of Ontario. He died in 1845 and she died in 1875. The land taken by them in the township of Goulbourn passed to their son, James, then to their grandson, Thomas Mansfield Scott; and at his death in 1917, passed into the hands of strangers. The present dwelling is a large stone house erected by James Scott in 1867. 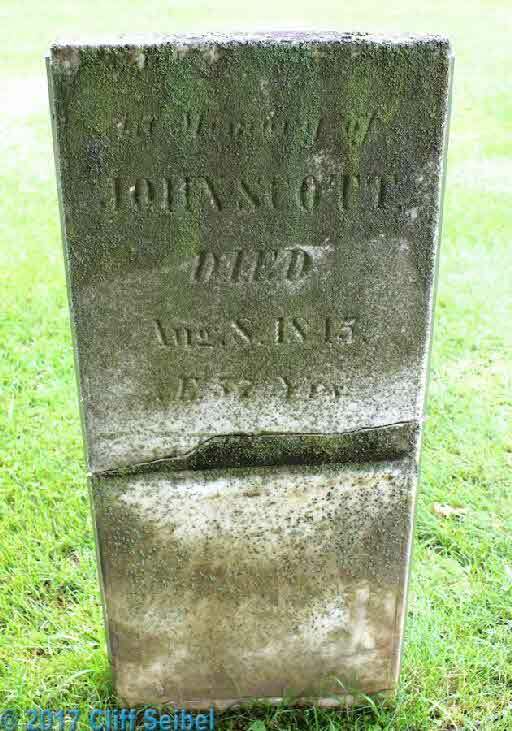 [S844] John Scott Cemetery Headstone, unknown repository, unknown repository address. From Unknown Newspaper: "Edgewood Farm, Marlboro, February 2--It is with sorrow we chronicle the calling away from amongst us of one of our oldest and most respected citizens, Mr. William Garland, whose name was familiar to nearly everyone in the county of Carleton, passed peacefully away on the 29th January, 1892, in the 83rd year of his age. He was born in Ireland in 1809, came to Canada with his parents when 11 years old. 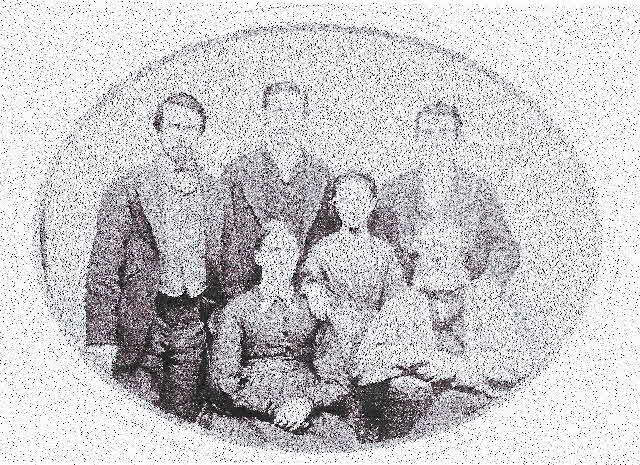 The family consisted of 16 persons, viz. father, mother, eight sons and six daughters; each of the children upon reaching maturity married. Twelve settled in the county of Carleton and two in the county of Lanark, where the scriptural injunction as complied with to multiply and replenish the earth. Four of the brothers died between the ages of 82 and 84 years. "Mr. Garland chose farming as his vocation. He first settled on a farm in the township of Goulbourn. Not finding the land what he anticipated he moved to the township of North Gower, then being opened up. He secured a farm upon which he lived until 1883. At that time he and his wife feeling old age coming upon them, resolved that the care and exertion of conducting a farm was too much for them. He disposed of it and procured a house in the village of North Gower, to use his own words "within the shadow of the church" where he remained eight years when again the feeling overcame him that the care or even the management of a house was too much for them at their advanced age and decided to board. He found a suitable place on the farm known as "Edgewood Dairy farm" in Marlboro adjoining North Gower, owned by John McCordick, Esq., whose wife was a favorite niece. The old homestead being built of stone, large and airy and surrounded by beautiful evergreens, they hoped to spend their summer months pleasantly, but in that they have been disappointed. Their stay with Mr. McCordick was most agreeable, and nearly his last words were in acknowledgment of the kindness he had received. Mr. McCordick in conversation, after his death, said, that in his illness he never heard him make a complaint, that his object seemed to be to give as little trouble as possible. "The funeral was conducted from Edgewood Farm on Sunday and was the largest seen in that locality for a long time upwards of 60 teams formed the cortege. The sad procession was led by rev. Robt. Atkinson incumbent, North Gower, to the old stone built church in that village, in the shadow of which he lived for so many ears. During the half mile before reaching the church the old bell tolled forth the solemn warning that a member of this earthly habitation had been called to his heavenly home. Rev. Mr. Atkinson conducted a most impressive service. The choir sang with organ accompaniment several hymns suitable to the occasion. Rev. Mr. Atkinson, under whose charge he has been for some time, preached a most impressive sermon. His words of comfort to the sorrowing friends were such as to give hope for a glorious resurrection. His prayers for the bereaved widow, who had lost one who had been a partner for about three-score years, caused the eyes of strong men to become bedimmed with tears. Service over the procession re-formed and wended its solemn way to the old churchyard at Wellington in which stands the little white church surrounded by hundreds of white marble monuments each one telling its own story. It may be remarked that the Wellington cemetery or churchyard, as it is called, is strikingly beautiful, sloping back to the west from the high road, displaying its solemn contents to the passers-by, while close on the eastern side flows the Rideau river in its silent meanderings, serene in its peacefulness fearing, as it were, to disturb the quiet dead. "In a grave near the summit they laid him and the Rev. Mr. Atkinson, who travelled these long miles over bad roads, was at this post to perform the last rites of the church, which he did most solemnly, while around the grave for the time it took to offer up his solemn offering of hopeful words every head remained uncovered and silent awe prevailed." He resided for a time in Dalton, Mass., and about 1816 removed with his family and with that of his father to Ohio, and settled on the western reserve. [S41] Sebastian Visscher Talcott, Talcott Pedigree in England and America from 1558 to 1876, Page 112, Item 476. Rebecca Warren was born on 17 March 1782. She was the daughter of Ezra Warren and Rebecca (?) Rebecca Warren married Joseph Talcott Jr., son of Joseph Talcott and Mary Thomas, in 1800. Rebecca Warren died on 14 February 1865 at Madison, Lake Co., OH, at age 82. Children of Rebecca Warren and Joseph Talcott Jr.
John Garland was born in 1770 at Coolcullen, Wexford, Ireland. He was the son of Colonel William Garland and Elizabeth Staples. John Garland died in 1845 at Goulburn, Canada. From "The Story of the Derry", by George Edward Kidd, 1943, page 68: " THE JOHN GARLAND FARM "This farm (W. 1/2, Lot 23) was homesteaded by John Garland, who brought his family here in 1819 from Coolcullen, in Wexford, Ireland, where he had been born in 1770. His wifes name was Butler, and they had a family of fifteen children, whose descendants are now scattered across Canada. All except two of these children were born in Ireland, and with the exception of three, all accompanied their parents to Canada. Those who temporarily remained behind were: Nicholas, who had arranged to be married; Thomas, who was serving as a bakers apprentice, and wished to complete his apprenticeship; and Margaret, then a girl in her early teens. She remained for a time with her brother Thomas, but came out two or three years afterwards with Mr. Keerfoot, who settled in the Prospect community. Her borothers followed soon afterwards. "John garland di not long remain in The Derry. His choice of farm had been one of those unhappy mistakes which was sometimes made by a homesteader in picking out a bush-covered lot. It was easy to clear, and for a time the rich loam gave an abundant crop; but the limestone was too close to the surface and the soil soon lost its fertility. In 1827 Mr. Garland quit his Derry Farm and moved to the second concession of Goulburn. Here he resided until the time of his death in 1845. The younger children accompanied their parents to the new farm and most of the older boys, some of whom had bought land in The Derry, also followed to Goulburn, and bought farms close to their father's place. The name of Garland is well known in that township, since at one time almost all the members of Johns large family resided there. "There were fifteen children in this family. Nicholas, James and Patrick we have mentioned before when referring to their connection with the Robert Scott farm. Edward, who was fifteen years of age when his father left The Derry, accompanied him, and later inherited the Goulburn farm. This property is now owned by a grandson of Edward--Eddie Garland--who, however, lives on a farm in the third concession. Next there was John, who also accompanied his father to Goulburn and bought a farm in the third concession. His son Stephen still resides here, being now ninety-one years of age. Of the remaining children, there weree: richard, of whom little is known except that some of his descend- ants now reside in Carleton Place; Thomas, who lived in Goulburn; William, Margaret (Mrs. John Kidd), Matilda (Mrs. George Leach), Ann (Mrs. Moore), Betty (Mrs. Kidd), Maria (Mrs. Hand), and Hetty, who married a Keys, a one-time teacher in The Derry. A little girl, Ellen, died while a child. "When John Garland quitted his homestead he retained possession until 1832, in which year it was sold to James Ferguson who had been a neighbor on the second lot to the east. The farm remained in the possession of that family until Knox Ferguson sold it to James Kidd previous to the formers departure for Dakota. It now belongs to Edgar Kidd who uses it only for pasture land. "Until recent years there stood on this farm an old roofless barn, which was build of rock elm logs. It was erected by John Garland and when torn down the logs wre perfectly sound. It is said that in raising the barn, the logs were felled within a few yards of its site, and were carried there by hand. Close by, there are traces of the foundation of the old Garland house: a rectangular embankment enclosing a depressed area in the center. There is also the old well, blasted from the limestone, its circular wall being perfectly smooth." Sarah Griffith was also known as Mary Griffith. She died in 1875. Rev. John William Garland was born on 4 May 1836 at Carleton, Ontario. He was the son of William Garland and Bridget Madden. Rev. John William Garland died on 10 December 1910 at Cambridge, MA, at age 74. He was buried at Portsmouth, New Hampshire. Nicholas Garland was born on 8 June 1841. He was the son of William Garland and Bridget Madden. James Halliwell was born on 7 June 1794. He was the son of Mark Halliwell and Barbara Swan. Note by Jessie Mcconchie Lesher: The above Agnes Halliwell, born March 1, 1796 is undoubtedly nancy Hallowell who married Joel N. Adams, though I have never run across this name any place else. so far as I know she was always known as Nancy. The following is from thu notes of Frances Ramsey wo took them as dictated by her mother, Jane Adams Allen, daughter of Joel N. and Nancy Hallowell Adams. "Grandpa Hallowell came from the south of Scotland, county of Roxburg (called Roxburrough), hamlet of Sprouston, not far from Earlston, where the Carter brothers came from. I have heard Grandpa and Mrs. Carter talk of common friends and of Grandpa's handsome sisters. This is about 30 miles south of Edinburg. I remember hearing of Kelso, Jedburg, Letholm, Durafia, and many others, but think Sprouston was where his home was. M. James, while staying at Kelso, visited the cemetary, where the Hallowells were buried; they died at a remarkably old ate. In an old exercise book Grandpa used in school his name was also spelled Hallewell and Halliwell. The exercises in Arithmetic were beautifully written and very neat. "In Glasgow, I think, you will find the Swans, who are among the gentry, if you please; twice I have been told so, by people who came from the same place. The Swans ae bankers, ministers, lawyers, etc. Reverend William Swan has sent sermons to Pa by George Davisson. I remember Mrs. Reagles telling of noticing a couple of people watching and talkinf of her on one of teh steamboats between New York and Albany, and at last the woman came over and asked |Mrs. Reagles if she were not a Swan, she was so like their minister at home, Reverend Mr. Swan, who had relations in America. "Grandma was Barbara Swan. I think her father was George Swan who lived near Albany when she married mark Hallowell." Another note along this line says the ancestors of the hallowell family in Scotland were buried at Lempitlaw, about six miles from Kelso, Scotland. One of their family was Povost of Fife. Agnes (Nancy) Halliwell was born on 1 March 1796. She was the daughter of Mark Halliwell and Barbara Swan. Agnes (Nancy) Halliwell died on 16 May 1876 at age 80. George Halliwell was born on 27 February 1798. He was the son of Mark Halliwell and Barbara Swan. John Halliwell was born on 12 November 1799. He was the son of Mark Halliwell and Barbara Swan. Peter Halliwell was born on 27 August 1801. He was the son of Mark Halliwell and Barbara Swan. From the cemetery on the northeast corner of the intersection of state routes 67 and 147, Saratoga County, NY, brown marble tombstones inscribed: Robert Hallowell died December 2, 1877 age 74 years Agnes Bell wife of Robert Hallowell died June 4, 1868 age 57 years. Blessed are the dead who die in the Lord Mary J. Hallowell daughter of Robert and Agnes Hallowell died May 29, 1867 age 24 years. Robert Halliwell was buried at Saratoga Co., NY. He was born on 5 April 1803. He was the son of Mark Halliwell and Barbara Swan. Robert Halliwell died on 2 December 1877 at age 74. Elizabeth Halliwell was born on 11 January 1805. She was the daughter of Mark Halliwell and Barbara Swan.